This IBM® Redbooks® publication updates and complements the previous publication: Implementing the IBM General Parallel File System in a Cross Platform Environment, SG24-7844, with additional updates since the previous publication version was released with IBM General Parallel File System (GPFS™). Since then, two releases have been made available up to the latest version of IBM Spectrum™ Scale 4.1. Topics such as what is new in Spectrum Scale, Spectrum Scale licensing updates (Express/Standard/Advanced), Spectrum Scale infrastructure support/updates, storage support (IBM and OEM), operating system and platform support, Spectrum Scale global sharing - Active File Management (AFM), and considerations for the integration of Spectrum Scale in IBM Tivoli® Storage Manager (Spectrum Protect) backup solutions are discussed in this new IBM Redbooks publication. This publication provides additional topics such as planning, usability, best practices, monitoring, problem determination, and so on. The main concept for this publication is to bring you up to date with the latest features and capabilities of IBM Spectrum Scale as the solution has become a key component of the reference architecture for clouds, analytics, mobile, social media, and much more. This publication targets technical professionals (consultants, technical support staff, IT Architects, and IT Specialists) responsible for delivering cost effective cloud services and big data solutions on IBM Power Systems™ helping to uncover insights among clients' data so they can take actions to optimize business results, product development, and scientific discoveries. 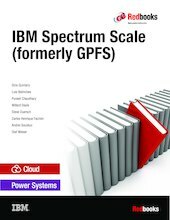 Note: This edition applies to IBM Spectrum Scale (formerly GPFS) v4.1.0.4 (TL1), SLES 11 SP2, SLES11 SP3, RHEL ppc64 6.5, AIX 7.1 TL3, Tivoli Storage Manager 7.1 Server, Client and Storage Agent (LAN-free), Tivoli Storage Manager for Space Management 7.1.1, and TSM for Space Management (HSM) 7.1.1.